Join the discussion on our forums! Come discuss Val'anyr over in our dedicated Val'anyr discussion topic. Deathrattle: Give a minion in your hand +4/+2. When it dies, reequip this. Recently unearthed in one of the deepest kobold caves. Traded for a large candle. This really feels like it should just go to hand, I don't see how you win against it if it gets played unless they just run out of minions. Probably the card I've had the most fun with, this expansion. The synergy with Saronite Chain Gang and Dopplegangster generates too much value. I've had the most insane games against control. I've been able to stabilize and come back against aggro. I'd vote this to be higher on the tier list than where it is, currently. i got golden dragon soul 4 weeks ago. thinking disenchant to get this beauty. should i do it or wait bit more? i haven't tried valynr with charge yet. so far been using it buffing minions in hand. get some really good ones, and i can get it back :} luv it. won a game enemy killed my minion and i got refunded the weapon which got me the kill blow :} hey probably forgot about the death rattle effect hehe. I played 50+ game with this card in my control deck, turn out this card is pretty good. only 4 mana & also useful in early game against an aggro deck. lifesteal & charge with 7 attack~ why not. 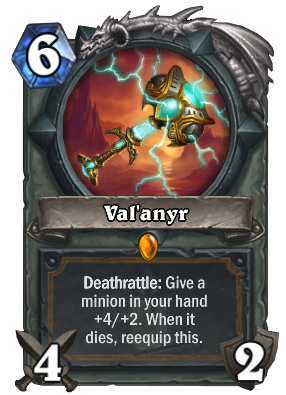 also good, but sometime i screw up if Val'anyr buff Faceless Manipulator, the buff will disappear if Faceless Manipulator copy other minion. 4. Doppelgangster also good... maybe.. I never tried by myself tho, quite expensive on mana & not a taunt, probably not an option against an aggro deck. not perfect but I have fun with this card. TIL: the Handbuff from Val'anyr does not reveal what card it hits to your opponent unlike the Grimy Goons Handbuffs. i dont have this weapon yet. i m opening KaC packs regualry and waiting for it unless im gonna craft it soon. Anyway lets make a theoraycraft with standrat agrooladin deck with this weapon . I hope to see faceless manipulator inside deck also. Double weapon after copied both friendly minions died right ? I'm working my way towards legend with a pally deck running this, and I think this weapon has a great spot in any tempo-based paladin decks, I'm happy to have received it. It might be obvious but this thing is crazy with charge cards since you can instantly get value back and avoid having the receiver of Val'anyr from being silenced or neutralized. I've been running Leeroy Jenkins, and lots of charge cards in a deck that's been working pretty well thus far. You can also do stuff like make Chillblade Champion receive it for giant bursts of healing, but I haven't gotten that to work in a deck yet. I've been using it with Leeroy, but even cheap charge cards like Bluegill Warrior suddenly turn into 6/4s with charge which really catches lots of people off guard. All I know is that It feels simultaneously amazing and dirty to claim lethal by smashing the opponent in the face with my golden 10/4 Leeroy Jenkins. I agree Val'anyr is OP with minions with charge. Guaranteed, immediate value. Eliminates most downsides of this card. 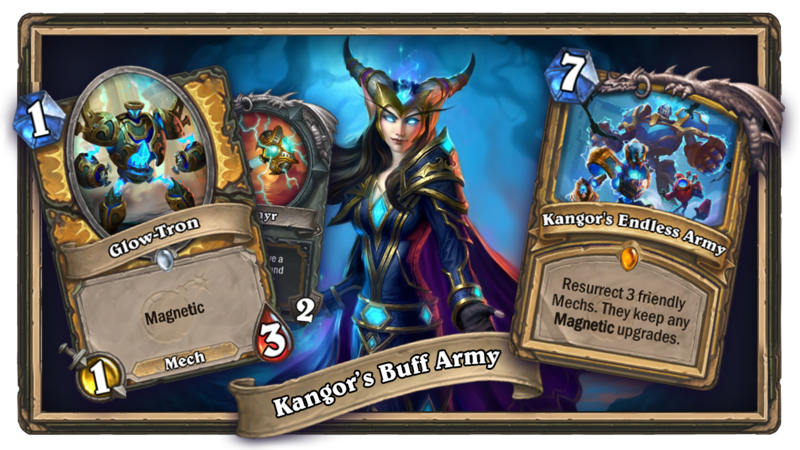 It is notable that charge has traditionally been a combo mechanic. In fact, all the legendary weapons introduced in this set are likely combo cards. A notable element of combo is lack of counter-play, and legendary weapons do lack counter-play because they effectively have infinite (or no) durability. Legendary weapons have also been weak and unsuccessful, just like Quests - another combo mechanic. This is my favorite legendary weapon of the set, and really hope it sees play. I, however, got Aluneth as my free weapon. Most OP weapon in this set, almost infinite value. I hope blizzard wouldn't nerf it. I think this is being severely overestimated. Waaay too slow. Only good combo I see is Doppelgangster.